I have checked for updated codecs, and *.MOV files should work.We haven’t had this problem before, so I’m sure its the iPhone 6 somehow, but can you think of anything? How to Solve can’t play iPhone video files on Windows Media player? iPhone can be a video recorder to record some video including 4K video. However, you may still get disappointed when you can’t manage to open your iPhone MOV file in your Windows Media Player or share them with other friends who’s on the Windows operating system. To figure out why and how you can solve this problem, let’s have a look at the supported file formats on Windows Media Player; asf, .avi, .dvr-ms, .m1v, .mp2, .mp2v,.mpg, .mpeg, .mpg, .mpv2, .wm and .wmv but not including the iPhone MOV or iPhone MP4 file. To smoothly import the iPhone MOV/MP4 files into Windows Media Player (Windows 12 included), you have’ll to convert the iPhone MOV/MP4 files to Windows Media Player 12 friendly format first. To play iPhone mov/mp4 video files with a non-Microsoft codec in Windows Media Player, you’d better to convert iPhone video to Windows Media Player compatible WMV, ASF, AVI, MKV, MPG, etc. at first. Well, Pavtube Video Converter is just the ideal WMP Converter which supports converting all kinds of iPhone video including SD, HD, 4K video to Windows Media Player supported video format. Besides, this video converter also can help you convert various video like MP4, MOV, FLV, MXF, AVI, MKV, H.265, XAVC etc to Windows Media player friendlay format. Install and run this smart app. Then you have two ways to import iPhone video files. Directly drag oneiPhone video file to this app or go to “Add File”. Click the “Format” drop-down button to select Windows Media Player more compatible format:. To convert iPhone video to Windows Media Player video format, select WMV, AVI, or ASF from the “Format > Video” Category;To convert iPhone video to WMP audio format, select WMA, MP3, or WAV from the “Format > Audio” Category; To convert iPhone video to WMP video format without quality loss, select HD AVI or HD WMV from the “HD Video” Category. Tips: Click the “Setting …” button to adjust the video or audio quality, codec, bitrates, file size, audio volume, audio channel and etc. 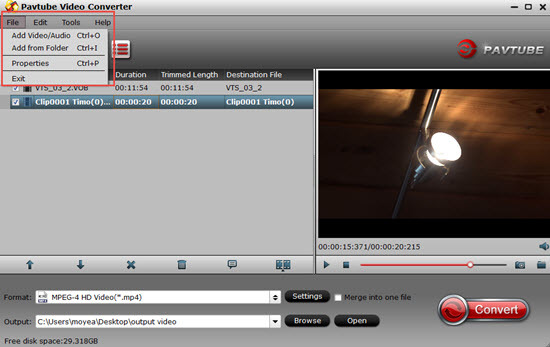 The smart WMP video converter additionally offers some useful edit functions to enhance your video. Click the Edit button to get it. Now, you need to hit “Convert” to convert iPhone video to Windows Media Player supported format. When the conversion is done, click “Open” to locate the converted WMV file on your laptop or computer. At this time, you can drag these WMV output files to WMP or use your windows your windows browser to navigate to the converted file and double click to run the video. You may encounter some weird problems when import and open iPad videos in Adobe Premiere Pro like no picture, video preview lag, render slowly or even program crashed. The reason is that iPhone videos are recorded in .MOV format encoded with H.264, which can’t be recognized by Premiere Pro. This tutorial will quickly walk you through how to drag and drop iPad videos to Premiere Pro timeline for editing without hassle. As we as we know, H.264 codec needs a lot of processing power to decode. So it is a bit hard to edit an iPad video in H.264 with Adobe Premiere Pro. To work iPhone videos in Adobe Premiere Pro smoothly, we need convert iPad video to a lossless format that is easier to edit in Adobe Premiere Pro. Here Pavtube iMedia Converter for Mac is highly recommended to help you encode your iPad files to Adobe Premiere Pro friendly editing-format. With it, you can effortlessly achieve the goal in just a few clicks. It also can convert various video like H.265, MKV, , MP4, MXF, XAVC, FLV etc to Premiere Pro editable format. What’s more, it also has the ability to convert all DVD, Blu-ray, SD/HD/2K/4K video to your desired formats, devices and programs optimized file formats, encode and decode H.265/HEVC codec, output M3U8 for streaming with local HTTP server, create 3D effect movies from both 2D or 3D resources on Mac (macOS Sierra, El Capitan Yosemite, Mavericks, Lion included). Now download the software and follow the below guide to learn how to transfer iPad video files to Adobe Premiere Pro for further editing. How to Maker Adobe Premiere Pro accept all iPad videos? Install and launch the iPad video to Premiere Pro Converter and load source clips to it. Click the convert button; it will start converting iPad video for importing to Adobe Premiere Pro immediately. When the conversion task is finished, click “Open” button to get the exported files and then import the converted iPad files into Premiere Pro CC/CS6/CS5/CS4 to do further editing. How to Convert iPhone (7) video to MP4 video? How to Play unsupported MP4 video on iPhone 7? You may encounter some weird problems when import and open iPhone videos in Windows Movie Maker like no picture, video preview lag, render slowly or even program crashed. The reason is that iPhone videos are recorded in .MOV format encoded with H.264, which can’t be recognized by Windows Movie Maker. This tutorial will quickly walk you through how to drag and drop iPhone videos including iPhone 7 videos to Windows Movie Maker timeline for editing without hassle. As is known, the iPhones (including iPhone 7, iPhone 7 Plus, iPhone 6, iPhone 6 Plus, iPhone 5S, iPhone 5C, iPhone 4S, etc.) record videos in .mov format. 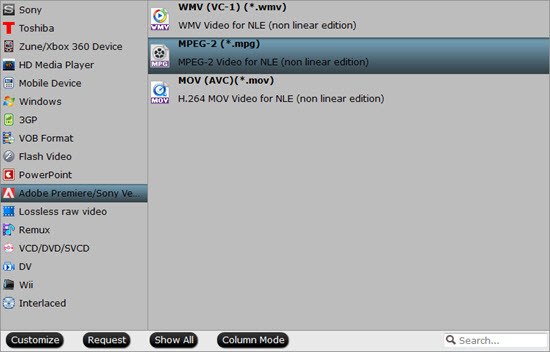 However, the MOV is not supported natively by Windows Movie Maker. So you need to convert the MOV to Windows Movie Maker compatible format like WMV before editing. ctually, it’s not as difficult as you imagine. 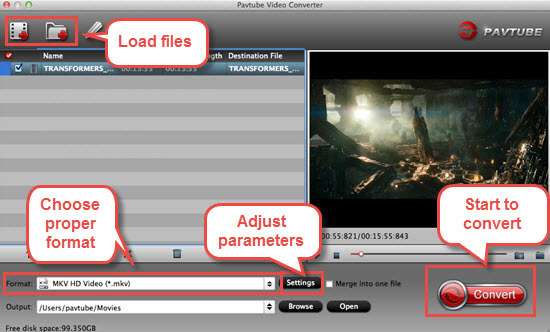 What’s need is a just a common video converter like Pavtube Video Converter Ultimate. It supports creating high quality WMV video for your Windows Movie Maker on Windows 10/8/7/XP/Vista, no matter what’s the format of your iPhone video or other source video files. Convert iPhone MOV/MP4 video to Windows Movie Maker supported video with 3 simple steps. Convert DVD, Blu-ray, ISO, MOV, MP4, MKV, H.265, XAVC, MXF, MTS etc to Windows Movie Maker WMV format. Convert iPhone video to PS3, PS4, mobile phones, Android, iPad, iPhone, Apple TV, NLE and other popular end devices. 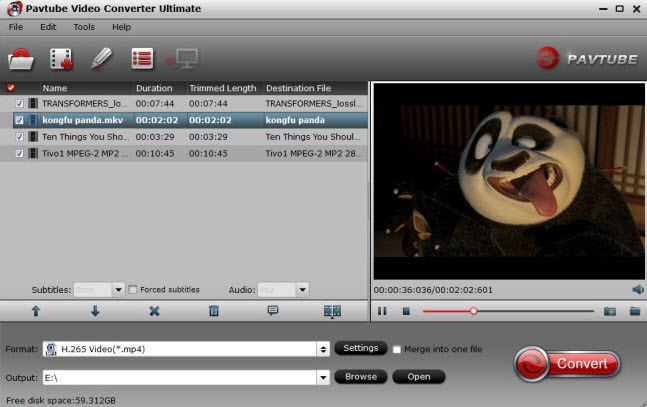 United free audio converter and video to image converter. Batch conversion and super fast conversion speed. Easy-to-use iPhone Video Converter with simple clear interface. 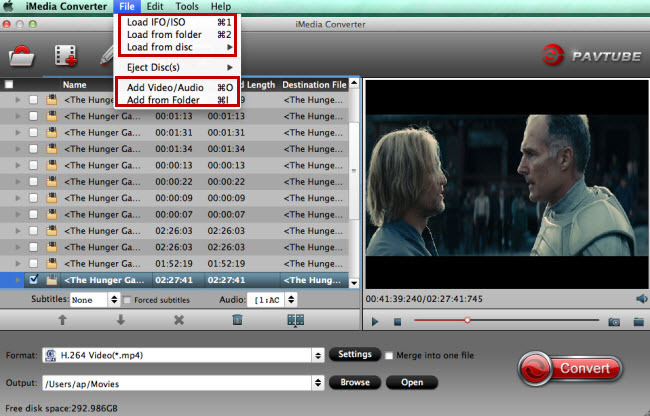 First download and install Pavtube Video Converter Ultimate. When complete, start this program from “Convert” menu or Windows desktop. 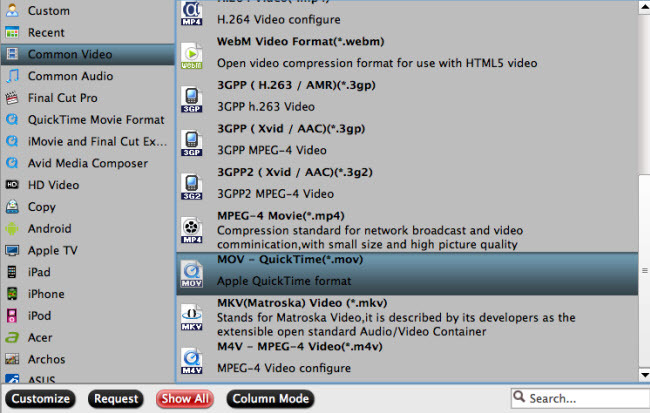 Click the format icon on the right to open the format list, and select “WMV” as the output format from Common Video or HD Video. If you want to make changes to the video settings like resolution, bit rate and other settings, click the “Settings” button at bottom. When everything is ready, click the “Convert” button and all the imported iPhone video files will be converted to WMV format by this iPhone video to Windows Movie Maker Video Converter.